1937 Foster and Reynolds Map or Plan of Washington D.C. Striking map of Washington, D.C. 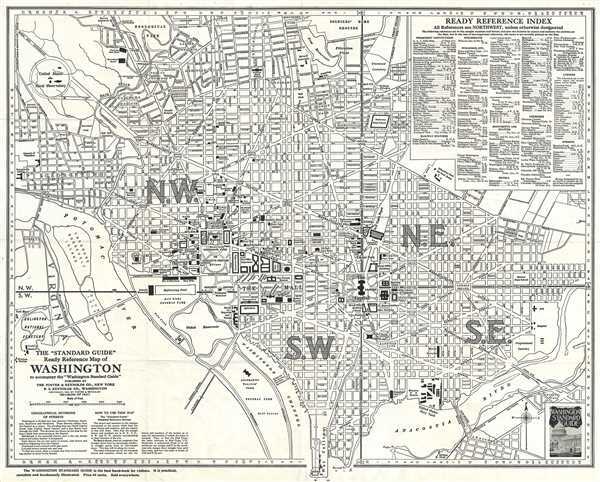 The 'Standard Guide' Ready Reference Map of Washington, to accompany the 'Washington Standard Guide'. This is a striking 1937 map or plan of Washington, D.C. by the Foster and Reynolds Company of New York. It covers Washington D.C. from the Arlington National Cemetery and Georgetown College eastward as far as 28th Street and the Congressional Cemetery and from the Soldiers' Home grounds to the Anacostia River and the War College (southern tip of Washington, D.C.). The map is exceptionally detailed, noting important buildings, monuments, streets, parks, railroads and an assortment of other topographical details. Other sites of note are the United States Navy Yard, Howard University, and the Zoological Park. The National Mall is also referred to as 'The Mall'. The city is divided in four sections marked N.W., S.W., S.E. and N.E. by lines emanating from the Capitol Building. A 'Ready Reference Index' is set in the upper right quadrant. Two short paragraphs in the lower left quadrant detail the geographical divisions of streets and a note on how to use this map. This map was first copyrighted in 1915 and went through numerous subsequent editions. The map was engraved by the Matthews-Northrup Co., makers of the Century Atlas, and was published by the Foster and Reynolds Company, Washington, D. C.
Matthews-Northrup Works (fl. c. 1900 - 1930) were a Buffalo, New York based, in their own words, "writing, designing, engraving, printing, [and] binding" firm. The firm was founded by George E Matthews as the J. N. Matthews Company. William P. Northrup later joined the company as an apprentice and then partner, at which point the firm was reincorporated as the Matthews-Northrup Works. The Matthews-Northrup Works rose to prominence as publishers and printers of Railroad Maps, with dozens to their credit. They also famously redesigned the cover of National Geographic Magazine in 1910. Despite some six previous cover changes in just 21 years, the Matthews-Northrup layout proved so popular that it was used for nearly 50 years. The firm can also take credit for the Winchell typeface, designed in 1903 under E. E. Winchell's tenure as art director. Curiously, the partners of Matthews-Northrup maintained an unusual affectation in which only the officers of the company could wear beards or mustaches. In this same spirit, the firm also had its own private social club, the Fellowcraft Club, where the all-male employees could relax, play pool, drink and dine. Matthews-Northrup maintained offices on Washington Street, Buffalo, where they were based, as well as Madison Square, New York City, Garden Tower, Boston, and the Citizens Building in Cleveland. Average. Repaired on verso and backed on archival tissue for stability.